Session replay refers to technology that enables companies to watch back videos of anonymized users interacting with their websites or apps. It provides teams with an ‘over the shoulder’ view of users experiencing their digital properties, so that they can quickly identify and remedy any problems or frustrations users face. Why are session replays important? Session replays provide qualitative user data, which is essential for gaining an understanding into how to improve digital experiences. Indeed, while quantitative user data from web analytics tools and website heatmaps gives the ‘what’, it is only by looking at qualitative that you can see the ‘why’. 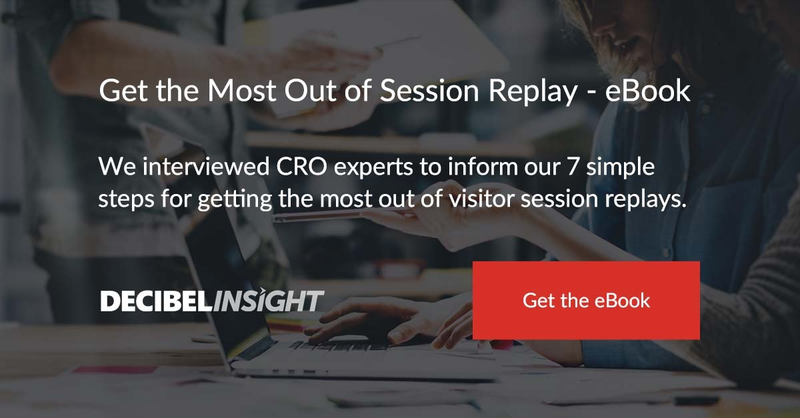 As WiderFunnel's Michael St Laurent says, "session replays provide incredibly in-depth insights. In fact, they often offer the easiest, most cost-efficient way to get into the minds of your customers." As ConversionXL-certified Dustin Drees says, "session replays are unique for providing a window into the raw user experience. Site visitors are not being influenced by tasks that you have provided them or changing their behaviour. They’re doing exactly what they’d usually do. The result? Session replays take out the bias from website evaluation, removing how you believe a website visitor will behave from the equation. None of our other conversion rate optimization tools can provide this in such a direct way." While session replays provide unprecedented insights into how users interact with websites and apps, there are potentially thousands of sessions for teams to watch back, which can be a drain on time. Decibel Insight’s session replay offering is therefore bolstered by algorithms that do the hard analytical work for you. Powered by machine learning, and based on the myriad behavioral metrics we collect, our technology both learns what a ‘normal’ user experience looks like on your website or app, and alerts you to anything that falls outside it. This makes it easy for you to quickly benchmark experiences, be notified on quirks in the data, and investigate any anomalous user journeys. As well as identifying behavioral trends, Decibel Insight’s algorithms automatically detect and alert you to specific user behaviors that exhibit frustration, such as multiclick behavior, bird’s nest behavior, frantic device rotations, and much more. Website analysis is not just about identifying content that doesn’t work, however. It’s as much about clarifying what does work. Are users reading your content? Are they engaging with your promotional banner? To learn more about session replays – and to see how the world’s leading companies use them to optimize their websites and apps – download our ebook below. Or explore Decibel Insight's heatmaps further.